If you answered all 14 questions correctly you scored 47 points and earned my admiration. 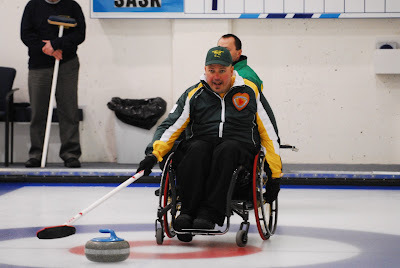 So how closely do you follow wheelchair curling, and how closely do you read this blog? Try your hand at our Christmas Quiz. Answers in a couple of days. 1. There have been six World Wheelchair Curling Championships, and seventeen countries have taken part. Scotland, England and Wales are three. How many of the other 14 can you name? 2. a. Which country or countries have won the most medals at World Championships and (b) how many? 3. a. Which country or countries have won the most golds at World Championships and (b) how many? 4. a. Which country or countries have won back to back world championships? (b) Who skipped? (c) Who coached? 7. What was special about the rocks used at the 2009 Worlds and that will be used at the Olympics and Paralympics? a) They were the same stones used at the Torino Games. b) They were made 5 lbs lighter to make it easier for wheelchair users to throw them. c) The handles had a special surface that allowed them to be pulled back as well as pushed forward. d) They had never been used before in competition. 8. Name the 3-time World Champion now coaching his national team. 9. Name the Paralympic champion now managing the Vancouver Curling Club. 10. What visiting provincial team came to Ottawa and played a 16 ender - and what was scored in that end? 11. Who is the wheelchair curler now appearing in the Canadian Curling Association's Start Curling television campaign? 12. Team Canada skip Jim Armstrong was given a formal job at the Canadian Olympic Trials Roar Of The Rings in Edmonton. What was it? 13. Which three teams appearing at the 2010 Paralympics have not yet qualified for the 2011 Worlds? 14. Name the provincial skip who will carry the Olympic torch in January in his home town. I'll be holding all comments until I post the answers in a couple of days. Good luck and a very Merry Christmas. Wayne Ficek has been given the honour of representing his home Kenora by carrying the Olympic torch on it's last leg into Kenora, ON. "I was just pretty excited, honored to be able to do it and humbled a little bit," he told The Lake Of The Woods Enterprise. "I think it's a wonderful opportunity, a once-in-a-lifetime type thing, eh?" Wayne sits on various boards and advisory panels and was nominated by friends in the community as recognition for the work he has done over many years to advance the causes of disabled Kenorans. He is also skip of the reigning Northern Ontario wheelchair curling champions, finishing fourth above Ontario at the 2009 Championships. 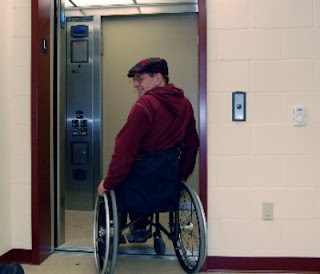 His team, leads Denise Miault and Cindy Hoffstrom, second Chester Draper and third Mark Wherrett, defeated rival Thunder Bay rinks by a score of 14 – 0 against Team Dawid and 7 – 2 against Team Levesque at the Fort William CC at the launch of the club's new elevator. The same teams will compete in January's Ontario Winter Games and the No. Ontario Curling Championships in Kenora February 5-7, 2010 for the right to represent Northern Ontario at the National Championships in Kelowna B.C.the following month. The Institute Of Sport, SportScotland's high performances arm, has published a paper describing why Team Great Britain throw from 10 or 15 feet further from the near hogline than any other team. The short answer is that Coach Tom Pendreigh in consultation with Senior Sports Psychologist John Marchant, and Head of Sports Science and Innovation, Malcolm Fairweather, think they found a competitive edge. Moving closer to the hack at delivery allows the stone to cross the hogline further from the centre line, widening the range available of shots. The coaches expected an initial "dip" in performance, evident in Scotland requiring a tie-break victory at the 2009 Worlds to avoid having to re qualify. But with the goal Vancouver 2010, and resources devoted to physical conditioning and psychological profiling, the coaches "see their hard work paying off, with a team who are more unified, happier and more performance focused than ever before." Recent rule changes moving rocks from centre line at delivery negate much of the presumed advantage. Vancouver 2010 ice, based on the 2009 Worlds, will have plenty of swing, perhaps making it unnecessary to add more width by moving back. The further away you throw, he more opportunity for things to go wrong. Players moving forward to throw takeout weight add another variable for the person holding the broom. And finally, other international high performance coaches have had two years to consider this experiment and have declined to follow suit. Team GB will have to keep believing that they are right and everyone else is wrong. My personal take: this may have seemed a good idea under the old rules, and started a multi-disciplinary process that gathered a momentum impossible to stop, or perhaps stopping would have been even more disruptive than playing it out. The wheelchair curlers were Britain's only Paralympic medallists in Torino. Their semi-professional squad faces enormous pressure to win. They've gambled on a radical change they hope will come good in March. If it does, they'll be copied. If it doesn't look for Coach Pendreigh to take the blame. Someone, probably from Finland, posted video from the Canada/Finland game in Draw 2 of the Czech Open in Prague on November 28, 2009. The game was posted on 3 segments. The quality is not great and not every stone has been captured but embed links are below, or you can access the host site directly HERE. The video does not always play at the first attempt. Canada played Sonja Gaudet at lead, Bruno Yizek, Darryl Neighbour and Jim Armstrong. Can't remember what happened and don't want to watch the video? Look up the result in the blog archive for November. Team Great Britain followed their appearance in the final of the Kathy Kerr in Ottawa by traveling to Lausanne, Switzerland the following weekend. Two teams from Great Britain competed against eight teams from France and Switzerland, with Manfred Bollinger's Berne team expected to offer the stiffest opposition to the McCreadie rink. Unfortunately, the Swiss and Berne skip Manfred Bollinger caught his hand in a door and broke a finger and was unable to compete. Great Britain went undefeated, beating a team from the Strasbourg CC 19-3 in the final. Team GB's coach Tom Pendreigh's report on the trip is HERE. Great Britain have one more event on their pre-Paralympics schedule, a home spiel with Sweden, Germany and Norway expected to compete. "Sometimes the pressure of expectation really drives you on. I think that's the effect it's had on us and we've used it in our build up and preparation for the event. "Wheelchair curling is still a relatively new sport and I think there's been major progressions from other countries as players have become more experienced over the last few years. "But we've been quite busy travelling over the past few months, preparing for Vancouver and things have been going really well." Radio-Canada Estrie a visité le Club de Curling de Lennoxville pour en apprendre plus sur le curling en fauteuil roulant. Mireille Roberge, animatrice de l'émission "Plan de match" s'est entretenu avec quelques-uns des joueurs en fauteuil roulant de ce club incluant le 3e joueur de l'équipe du Québec Carl Marquis et le capitaine Benoit Lessard qui porte toujours une attelle sur la jambe suite à un grave accident de ski nautique survenu l'été dernier. Dave Kawahara and Dave Forester get the credit for starting the process that raised $370,000 for the elevator project. 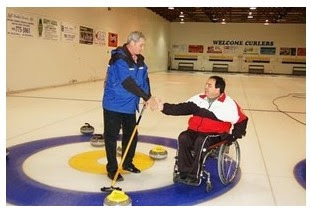 Wheelchair user and club member Terry Lynch told TBNewswatch.com that curling is 10 per cent on the ice and 90 per cent social. "I’m now a full member of the club," Lynch said. "I was always a member but now…when there is a function or event or send off of a team, I can now participate in them and be fully involved." Read the article's by Jeff Labine and Graham Strong on the Grand Opening. The Bradford CC is teaming up with the Canadian Paraplegic Association to host the Rock & Roll Funspiel on Saturday January 23rd. Bradford is the home club of Team Ontario skip Ken Gregory who told the Bradford Times that he changed venues from Toronto when the club made the ice and washrooms accessible six years ago. The organizers hope the spiel will build interest in curling, and especially in wheelchair curling as an activity for those with spinal cord injuries. "It's one of the few sports that wheelchair and able-bodied can play on equal ground," Gregory says. The goals are to raise funds for the Canadian Paraplegic Association Ontario, but also to raise awareness of the challenges and triumphs of people with spinal cord injuries living in the municipality. You can see the event poster and registration details HERE or register on-line HERE. Labels: Bradford CC, Ken Gregory. 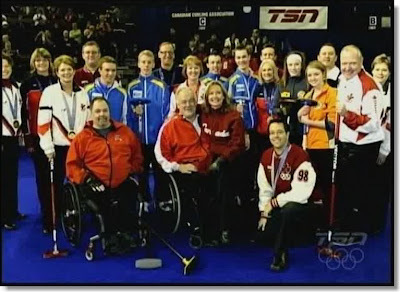 Jim Armstrong took part in the opening ceremonies of the Tim Horton's Road To The Roar Olympic Trials in Edmonton, along with many familiar faces pictured above. How many do you recognise? He was also featured in a six minute nationally televisd profile prior to TSN's coverage of the Women's Olympic Qualifying Final. Team USA lead Jacqui Kapinowski completed her 52nd marathon this past weekend in Palm Beaches, Florida. The next day she flew to Utah to try for a spot on the archery team for the 2012 Paralympic Summer Games. "I don't know if I will be able to pull back the bow, my arms will be so sore," she told the Sun Sentinel. The 'Wheelchair Watch' column for December is now in the website archive. Topics covered included an overview of November's competitions, and two major issues of concern to wheelchair curlers: widening the eligibility pool and extending the ban on electric wheelchairs. Armstrong - "Too soon for Paralympic trials"
Jim Armstrong participated in the opening ceremonies at the Olympic Trials in Edmonton Sunday, one of four holding brooms for ceremonial first rocks. Sun Media's Con Griwkowsky took the opportunity to profile him. Even though Armstrong found the idea of holding an Olympic wheelchair qualifier at the same time as a Canadian curling trials compelling, he figured it might be an idea best saved for sometime in the future. "You know what? 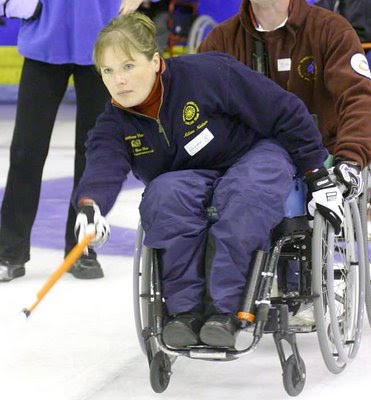 Wheelchair curling is still a little young," said the personable Armstrong, a former dentist. "We've certainly got the infrastructure, but we don't quite have enough bodies yet. It's coming, but we're only eight or nine years in Canada. Give it a few years and, yeah, it might make sense." Fortunately we have four years to argue the case and justify a Paralympic Trials. Coach Ernie Comerford says: I have been experimenting with additions to some delivery sticks with handles from garden tools to see if this might help the thrower throw more easily and be more consistently accurate. Feel free to improve on these ideas. Garden tool handles were purchased from a standard “box store” (Home Depot). Metal tool was removed and inside drilled out to ¾ inch size. Dowling then added and epoxy glue used to hold then into the delivery stick. Photo 1: Shows indentation in this type of handle which “forces” the player to hold the stick in the same spot each time. Soft rubber handle. Photo 2: Top view. Handle is attached and aligned. Note thumb indentation spot. Photo 3 - Side View. Note groves on side for better grip, hook at end for hand. Photo 4 - Shows player gripping stick. Note thumb in indentation. COMMENTS – This has been adapted quite well on Goldline sticks. Some concerns on Extender Sticks as it may/can be hard to realign the handle and the throwing end once loosened or extended further. However I believe we will find the Extender Sticks will be just as good if not better due to weight. One player in particular believes it has made it easier for him to be much more accurate and consistent. Photo 5 - Top view. Thumb indentation on top. Soft rubber for easy grip. Grooves on top only. Photo 6 - Note pronounced hook at end. Handle shape has been well received. The aim was to find a handle that would make it easier to be consistent. Concept came from the golf teaching aid (Golf Grip handles) which try to get a golfer to hold the club in proper position. Initial trials have been satisfactory. Cost of the handles runs about $6 to $9 each. Smaller female hands seem to be no problem. Thoughts have been given to angling the handle even more to make it a totally “natural” hand angle. One player uses the handle in a reverse position and finds it fine for them. He left part of the metal handle of the gardening tool in and glued it into the delivery stick. He finds it lowers the angle of the stick to the ice surface. Using pvc electrical conduit pipe with a 45 degree angle. Cost less than a dollar. Fits an all sticks. NOTE – how player can move hand forward or backwards to their “spot”. The angle of the force then changes. We have not done any lengthy experimentation yet. Concept seems fine though. a) USE OF COPPER OR PLASTIC TUBING. It may be possible to design a handle with various angles to suit the player. A 45 degree elbow could be used on a garden handle to also alter the players hand angle. Combos could be tried. b) HAND MOULDS - Perhaps these could be used to make a unique handle for individual players. Thus perhaps allowing for maximum force and control. I hope these are helpful to some wheelchair curlers. We are still an evolving sport technically and I am pleased to share some ideas to hopefully better the sport. Team USA coach Steve Brown told Universal Sports reporter Josh George that involving all the team members in the game will help skip Augusto 'Goose' Perez and improve the team. “When you can get four people, four sets of eyes (assessing the situation), you’ll be a lot stronger than one,” Brown said during a phone interview. Read what you will between the lines here, but having met the team and seen them play, I know Goose is a forceful personality who relishes the big occasion and the opportunity to make the spectacular shot. If he is able to draw on the insights of the quieter members of his team, the game calling may become less adventurous, but USA's medal prospects may improve. End the WCF ban on power wheelchairs now! The World Curling Federation, at its semi-annual meeting taking place in Aberdeen this month during the European Championships (regular curling) has two items on the agenda directly affecting wheelchair curlers. Agenda item 22 - Should electric wheelchairs be allowed at World Wheelchair Curling Championships? WCF Recommendation: Electric wheelchairs should not be allowed at World Wheelchair Curling Championships or their qualifying events. You can read my reasons for wanting the ban lifted in the Wheelchair Watch column in the December issue of SWEEP d-Mag. 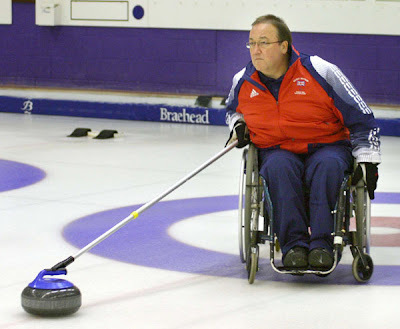 Curlers using power chairs have more than enough obstacles to overcome without being victimised by discriminatory rules based on impressions rather than evidence. The ban will continue unless you contact your WCF representative and ask them to end the ban now. 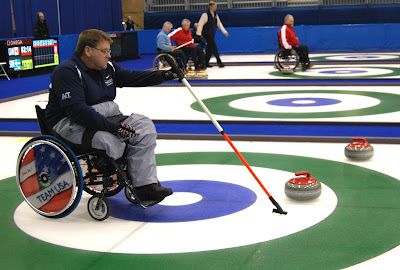 A second proposal under consideration is to extend the eligibility for wheelchair curling beyond the present definition of "requiring a wheelchair for daily mobility" to including people with substantial (described and evaluated) disabilities who are unable to curl without the use of a wheelchair. This proposal is part of a substantial discussion document prepared by the WCF vice-President Kate Caithness concerning classification and eligibility, as well as addressing the fact that there is no present mechanism to appeal a classification decision (in either direction). There is no present WCF support beyond promises of further study for Michaael McCreadie's suggestion to include more severely disabled wheelchair users in a separate classification, mandating inclusion on competitive teams. Final decisions on rule changes will be made at the WCF annual meeting in April, but delegates are meeting this month in Aberdeen to discuss what changes might be made. Jim Armstrong will be one of the special guests at the Opening Ceremonies at the Tim Horton's Roar Of The Rings in Edmonton. He can discuss with Randy Ferbey the mechanics of external team selection. Ferbey has insisted that he won't allow the CCA to influence his pick of a 5th player should he win the Olympic trials. CCA chief Greg Stremlaw is quoted as saying that the CCA owes a duty to the Canadian Olympic Committee to not allow just anyone (a 5th) to play. "Obviously the individual can't be just anybody, right?" Apart from the insulting inference that a skip on a competitive team would select "just anybody," Stemlaw is wrong if he cares about the overall heath of the sport he is paid to oversee. The health of a sport relies on the enthusiasm of its participants, not the ambitions of administrators and funders. 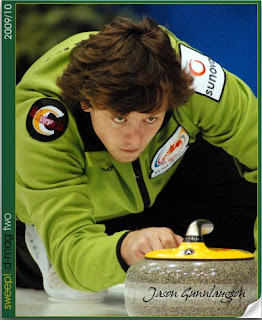 The ability to choose who you play with is the essential fertilizer of Canadian grassroots curling. Canada does well internationally because from those grassroots grow a great many teams, raising each other's play by competing as a unit to be the best. If you define a sport in terms of podium success, you end up with a tiny group of sponsored athletes drawn from an ever-diminishing pool that will see no incentive to grow larger. That's how it is in most countries, and that's how it may, but does not need to become in Canada. While Armstrong has bought into the apologists' argument that there has not been enough players to justify a 'win to play' system in wheelchair curling, and is fulsome in his praise for the team members who have been chosen to play alongside him, he tells me he is open to exploring other proposals after the Paralympics.